We hope you’ve been enjoying our series The Common Thread. Have you ever thought how intricately the Bible is woven together? We shouldn’t be surprised that God has connected His entire Word from Genesis to Revelation but most of us have never thought about it. What is that common thread? It’s found in Genesis 12. God called a man, Abraham, to step out in faith. He promised three things: land, people, and blessing. If you are a follower of Jesus, you are a benefit of the blessing! This week we focus on God giving the Jewish people a particular piece land. Out of all the places in the world, the land of Israel is what God chose to give them. But why? Chris will explain how God led His people there and made this area the center of the world. We aren’t always aware of the “why” when it comes to God and His ways. He is able to do what He pleases when He pleases. But sometimes He is merciful to give us a glimpse into His ways and giving the Jewish people the land of Israel is one of those instances—it is the center of the world! People were coming through the land from all over the world and the Jewish people had an opportunity to share with these travelers about Elyon: the Most High God. So how does this relate to us as believers in Jesus? Listen and find out! If you missed Part Two of this series, we encourage you to Listen Now. Steve Conover: This is The Friends of Israel Today. I'm Steve Conover and with me is our host and teacher, Chris Katulka. We're continuing our series called The Common Thread. Chris, over the past few weeks, you mentioned that God's promise to Abraham included three elements: Land, people, and blessing. So I'm curious to know why you think God, the Creator of Heaven and earth, is so interested in land, especially a small portion of land in the Middle East. Chris Katulka: You're right. I mean, it really is a tiny portion. Israel is smaller than the state of New Jersey, and yet God does. From the Bible, we definitely see that God cares about this very tiny plot of land. He puts a lot of energy into it. And I actually believe there's a purpose there. I once had a friend say to me, "Chris, why is God so interested in real estate?" Well, I think in this message we're going to see that God actually puts a lot of value in it because it's not about the land. It's about everybody. It's about the whole world and it has to do with this land called Israel. Now, before we get to our message today, first let's take a look at what's happening in the news. Iran's top general recently said the Islamic Republic of Iran will keep its military advisors, revolutionary forces, and its weapons in Syria. This statement was made in response to Israeli Prime Minister, Benjamin Netanyahu's call for Iran to get out of Syria, or else Israel will continue its strike against Iranian targets in the area. Well, here's my take. You know, the Iranian Revolutionary Guard in Syria puts Iran right at Israel's doorstep. And I think it's important to remember, Iran is by far one of Israel's greatest threats in the region. They regularly call for Israel's destruction and their footing in Syria definitely helps them inch closer to accomplishing that goal. I think Iran, should take Netanyahu's advice. They should retreat and then they should take that money that they're investing in Syria to stir up conflict and they should invest it in their own people who are currently facing an economic crisis. We are spending the next few weeks looking at the common thread that binds the whole Bible together. It's the promise that God made to Abraham, a promise that God would give the Jewish people a land, that's Israel, descendants, that's the Jewish people, and finally a blessing. That God would bless those who bless Israel and curse those who take this covenant lightly, and that through Abraham and his descendants, they would bring blessing to all the families of the earth. So I have heard and read on several occasions that one of Israel's major sins is that they didn't go out of Israel and share the good news of the one true God, the God of Abraham, Isaac, and Jacob. Instead, they stayed isolated. They stayed put. They got selfish and they didn't leave home. And now I understand where people get this idea. They take Jesus's command for the great commission to go into all the nations and make disciples, and they take Jesus's command and they read it back into Israel. But see, that's not what God called Israel to do. There's an ancient biblical town in Israel called Megiddo. Megiddo sits at the west side of the Jezreel valley in the northern part of Israel. And Megiddo is famous in the Bible from Book of Revelation. The Apostle John sees a prophetic battle unfold in Revelation chapter 16, and this battle unfold at Har Megiddo. And “Har” in Hebrew means mountain. So this prophetic battle happens at the mountain or the hill of Megiddo. And when you cram Hebrew words together, which was pretty common for Greek speaking people to do around the time of Jesus, when the Bible was being written in Greek, they would mash the word Har and Megiddo together, and it comes out like Armageddon. And if you've ever heard of the battle of Armageddon, it actually comes from this phrase, Har Megiddo. This prophetic battle is going to happen at the hill or the mountain of Megiddo. Now my point is not to talk about Armageddon or this prophetic battle. Megiddo is what I want to focus on. Megiddo has existed for thousands of years. It goes back before even Israel conquered the land. When you go to Israel today to visit Megiddo, the town of Megiddo, you actually walk up of a large fake hill. In arabic, it's called a Tel. It's called Tel Megiddo. And a Tel is just a fake looking hill that actually has levels of civilization buried within it. And Megiddo by far has the most levels of civilizations that are just built one on top of another. When one civilization would come in and conquer another, it would destroy the city, burn it, and then build another one on top of that. And so when archeologists dig into the Tel, they see civilization and then a burn level and civilization and then a burn level. And there are 26 layers of civilizations that spanned thousands of years, right at Megiddo. Ancient people groups, ancient empires, they wanted to control Megiddo in Israel. And over the years, 34 battles have been fought in the Jezreel Valley, right at the base of Tel Megiddo. And folks, even Napoleon Bonaparte declared it to be the most natural battleground in the whole earth. The last two major battles that were fought at Tel Megiddo were in Israel's Independence War back in 1948, and at World War One at the battle ... It's actually called the battle of Tel Megiddo. Friends, the reason I tell you this, it's actually for a reason. The nations of the world for millennia, for thousands of years, wanted to control this small outpost city in Israel. Why? Well, if you look at the map of Israel, Israel's actually a natural land bridge that connects three major continents, Asia, Africa and Europe. And the surrounding seas and deserts forced all who traveled to Egypt by land to walk through Israel. And so as a result, the armies of Egypt, Assyria, Babylon, Persia, Greece, Rome, they all invaded Israel in order to control this amazing international highway that ran right through it. And in fact, the narrowest point of these ancient highway systems in Israel was actually at Megiddo. Megiddo was incredibly wealthy. Even though it was small, it was incredibly wealthy, and the envy of every major empire of the past because it's the place where you could literally put a toll for passage. The whole world and trade system flowed through Israel and right past Megiddo. So it was like the toll road and everybody collected their pay as the world was traveling through and around Megiddo and around Israel. So what does this actually have to do with God's promise to Abraham or the fact that Israel didn't go out and share the good news of God with the nations of the world? Well, the first is this. God chose the land of Israel on purpose. You know, God told Abraham to go to the land for a reason. Remember he says, "I've chosen a land for you." Genesis chapter 12 says, "Go to the land that I will show you." God told Abraham to go for a reason. God didn't just spin the globe and randomly let his finger land wherever it would fall, and it just so happened to land on Israel. No, he actually providentially chose the one place in the world where every nation, tribe and tongue were forced to enter and interact with God's chosen people. See, God didn't call Israel to go into the world. It's actually quite opposite. God brought the world to Israel. And when caravans of traders would travel from one place in the world to another place, they would stop in Israel. They would interact with Israelites, who if they actually remained obedient to God's law and love the Lord, their God, with all their heart, soul, and mind as the text calls the Israelites to do, then these caravans would hear about God and carry the message of God to the various places that they would go. See these caravans, didn't just carry goods. They carried new ideas from one culture to another. They were like an ancient internet, just much slower. The message that was communicated from the Israelites to the world was the belief and faith in one God, the most High God, the God of Abraham, Isaac and Jacob, not hundreds of gods. And think about this, in Israel's Day, this concept of one God, believing in the most high God was completely counter-cultural. Nobody believed in just one God. But see, the Israelites had an impact on the cultures as they were coming in and out of Israel, and this message spread that this group of people, the Hebrews, the Israelites, only believed in one God and they believe he's the creator of heaven and earth. So it wasn't a sin that Israel didn't go out of Israel. So what was the sin then? What did they do wrong? See, God purposely placed Israel in just the right spot, and the one thing God asked of Israel was to remain obedient to him. God actually tells Israel in Deuteronomy, chapter 28, that if they would remain obedient to him, he would bless them in the land. Listen to what God says in Deuteronomy Chapter 28:1, "If you indeed obey the Lord your God and you are careful to observe all his commandments, I am giving you today, the Lord your God will elevate you above all the nations of the earth." And in verse nine, it continues. "The Lord will designate you as his holy people just as he promised you if you keep his commandments and obey him, and then all the peoples of the earth will see that you belong to the Lord and they will respect you." But then God reminds Israel if they disobey him and fall away, he will actually banish them from the land that he promised them. And now that doesn't mean that God is over with Israel or that the covenant that God made with Abraham is over, but that God would punish them by kicking them out of the land and giving them an opportunity to repent to bring them back in. The prophet, Ezekiel, really explains it perfectly. Let's listen to what the prophet says here in Ezekiel 5:5. It says, "Thus says the Lord God, 'This is Jerusalem. I have set her in the center of the nations with countries all around her. She has rebelled against my rules by doing wickedness, more than the nations and against my statutes more than the countries all around her, for they have rejected my rules and have not walked in my statutes.'" God is saying in Ezekiel, "I put you, Israel, I put you right in the heart of the world so that you could be my ambassadors, that you could be my representatives through obedience to me. But instead, you chose to look like every other nation." And see, God didn't want Israel to go out. He actually wanted Israel to stay in the land, to remain obedient to God and to follow him. And actually, this is one of the reasons we have the new covenant today. Go back to Jeremiah 31:31. It talks about this prophetic vision in Jeremiah of a new covenant that's coming, and the reason that God puts the law in their heart, it says that I'm going to transfer the law from tablets essentially and put a new covenant together, not like the old covenant, but a new covenant that will be in your heart. And the reason for that new covenant, think about this, is so that Israel would remain obedient to God and then God could keep them in the land and fulfill the promise that he made to Abraham, Isaac, and Jacob. So even the new covenant is connected to the idea of obedience and staying in the land. God didn't want Israel to go out. He wanted Israel to stay obedient and follow him, and when we return, listen, when we come back, I want to show you how this desire for Israel to stay obedient in the place where God chose for them has a direct connection to your life. So I hope you stick around. Steve Conover: Each year, we hold prophecy conferences in select cities in the United States and Canada. We realize not everyone can join us, so we'd like you to know that our 2018 prophecy conference highlights, they're now available in several formats: DVD, CD, and MP3. Enjoy all 15 sessions from the series entitled, The Sign of His Coming. This covers what Jesus said from the Mount of Olives, including his predictions about Jerusalem, the Tribulation, and His Second Coming. The series is an excellent tool for Bible studies, on your own, or in a group. 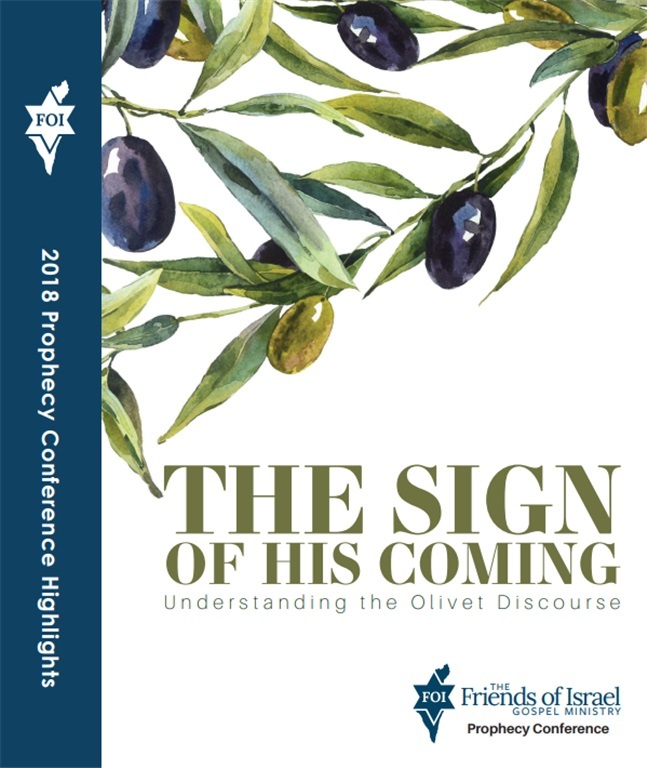 To order your copy of the 2018 prophecy conference highlights, The Sign of His Coming, go to FOIRadio.org, or call our listener line at 888-343-6940. Again, that's FOIRadio.org, or call our listener line at 888-343-6940. Chris Katulka: Welcome back, everyone. We are trekking through our series here, The Common Thread series. And our desire is to show you that the stories and characters and poetry and prophecy of the Bible, both in the Old Testament and New Testament, rest on a promise that God made to Abraham 4000 years ago. It's the promise of the land, Israel, the descendants, the Jewish people and a blessing. And that God would preserve and protect this promise and that through this promise would come the ultimate blessing to all the families of the earth, Jesus Christ. And really, this promise to Abraham is the wellspring of the Bible from beginning to end. Now, in the previous segment of the program, I tried to show you that God called his people to the land for a reason. God chose this tiny little portion of land for a reason. God planted his people in this land on purpose. They were purposefully placed to be used by God. God didn't need to send Israel out to the world, but instead God brought the world to Israel. And it was through their obedience, right where God placed them, that he would use them. But it all started with two elements here. Number one, faith. They had to have faith in God, and number two, they had to remain obedient to God. And I think about how this applies directly to us. You know, sometimes I think as Christians, to really do God's will or to really accomplish the great commission to make disciples, we need to do something radical for God. We need to go to a far away land or learn a new language or go to a different country and serve God there. But here's what I think we can glean. Here's what I think we can learn from God's placement of Israel in the land. In faith, God wants us to remain obedient to him, right where he places us. In faith, God wants us to remain obedient to him, right where he's placed us. And I have some friends who were planning on taking their family to Africa to start this business mission model to help those in need, to give people in Africa a good job and good pay. And through that opportunity, our friends could be a witness for Christ in the lives of these Africans. And I can remember sitting in church watching them be sent by our pastor to go. And just within a few days of leaving, the whole thing fell apart. The bottom dropped out and everything they planned for and worked toward just fell apart. And they started to question what God was doing in their life. And my friend went back to his normal job and they settled back down in their house again. But then a few years later, right where God placed them, not in Africa, not sending them out, right where God placed them, by remaining obedient to God and his call in their life, they actually started a ministry to a large refugee population right in the city that we were living in. And this ministry does exactly what they were hoping to do in Africa by providing refugees good paying jobs in a safe environment while being able to show them and share with them the love of Christ. God purposefully placed them right where they were to fulfill his calling as they remained obedient to the Lord. And folks, if Jesus is your Messiah and you have the Holy Spirit dwelling in you, then God has called you and he has gifted you to serve him. He's given you a purpose. He's given you a mission. And the beauty of God's calling is that much like Abraham, he calls us to step out in faith, and in stepping out in faith, he wants us to do something even further. He wants us to build upon that faith. Obedience in him. It's obedience to follow him. It's obedience to look to him. It's obedience in faith to do the things he's called us to do. And it's through that obedience that God brings the world, think about this, to us. Wherever you stand right now is the place God wants you. And he wants to use you through obedience to serve him, whether you're at home with your family or at work with your colleagues, or at school, or in church, wherever you are, God has purposefully placed you right where you can be the perfect conduit of his blessing. But what's the one thing he wants from us? He wants us to remain obedient to him. Mike Kellogg: Not long ago I was out walking, and four Ultra Orthodox men stopped me on the street. "Do you recognize us? We had a long conversation with you more than a year ago, and you promised to continue our conversation. So are you ready?" "I'm always ready." "We spoke about this man," one said. By this man, they meant Jesus. The Orthodox will not say his name. "My job is not to speak to you about a mere man, but I will be happy to continue our conversation about the need to have faith in the Lord according to the Bible. You put your faith in fictional stories and in your rabbi's." Then one asked me which God I believe in. They do not understand we believe in a single God composed of three persons: Father, Son, and Holy Spirit. So I showed them, Deuteronomy 6:4, which they chant three times daily in their synagogues. "Hear, oh, Israel, the Lord our God, the Lord is one." One man angrily asked me, "In how many gods have you believed? We know whom you worship. How did you find him?" "This is a good question," I replied. "If you read from God's word alone, you will learn how to know the Lord personally." "Show us where there's this written," one said. I opened my Bible to Zachariah, 9:9 where it is written, "Rejoice greatly, oh daughter of Zion. Shout, oh daughters of Jerusalem. Behold, your king is coming to you. He is just and having salvation, lowly and riding on a donkey, a colt, the foal of a donkey." I told them, "You are in darkness. If you will worship God alone, then you will see the great light." "What great light?" One asked. So I showed them Isaiah 9, where it is written, "The people who walked in darkness have seen a great light." They examined it closely to make sure it was the Bible, and they wanted to know which rabbi taught me this. I told them, "I do not learn from rabbis. I learned from the Bible." One replied, "Most Christians speak about this holy spirit, but faith in such a one is against our religion." So I asked them if they considered King David a Christian. "No," they all declared, "He was a good Jew." So I asked if they believe what is written in the psalms. "Of course," they all replied, "Please read Psalm 51. Pay attention to verse 11, since you say only Christians believe in the Holy Spirit." They read, "Do not cast me away from your presence and do not take your Holy Spirit from me." They were shocked. "I cannot believe what I have just read." I said, "There is a big difference between those who trust in the Lord and his word and those of you who trust in stories, in the words of men." Please pray that these men will study the Bible on their own and let the Holy Spirit speak to them through it. Steve Conover: Thanks for joining us today. We hope our study is revealing to you how your personal faith in Christ is directly linked to God's promise to Abraham. Today we saw that God didn't randomly choose the land of Israel, but that the Israelites were purposely placed there to obediently serve God, and in turn, God would use them to bring spiritual blessings to the nations. Chris Katulka: And I think this has direct connection to us. I mean, think about it. In the same way God providential placed Israel, the Israelites, in the land of Israel, and through their obedience to God, God would use Israel to impact the world, in the same way, God is calling us wherever we are, moms, dads, business owners, when you go to work, wherever you are, God has providentially placed you. And what he wants the most of us is that we obediently look to him. Steve Conover: Our host and teacher is Chris Katulka. Today's program was produced by Tom Gallione, co-written by Sarah Fern, Mike Kellogg read Apples of Gold. Our theme music was composed and performed by Jeremy Strong. I'm Steve Conover, executive producer. The Friends of Israel Today is a production of the Friends of Israel Gospel Ministry. We are a worldwide Christian ministry, communicating Biblical truth about Israel and the Messiah while fostering solidarity with the Jewish people. Zvi was stopped by a group of orthodox men who recognized him from a conversation he had with them once before. The men had many questions for Zvi because they knew he was a Christian. One question the men wanted to know is how God is Three in One: Father, Son and the Holy Spirit. Listen how Zvi took these men to their own Scriptures to show them the evidence of the Trinity. »Take My Life, and Let it Be (Timothy Shaw, Rejoice! Devotional Hymn Settings) Used with permission.